Ahh…the junk drawer. We all have (at least) one. I don’t know how things work in your home, but in my house, the junk drawer tends to take on a life of its own. Every time I try to organize my junk drawer, I find myself asking, “How did THAT get in here?” Thankfully, junk drawer organization has never been easier… as long as you follow these quick and easy tips. So, just how exactly are you supposed to achieve junk drawer nirvana? I’m so glad you asked! 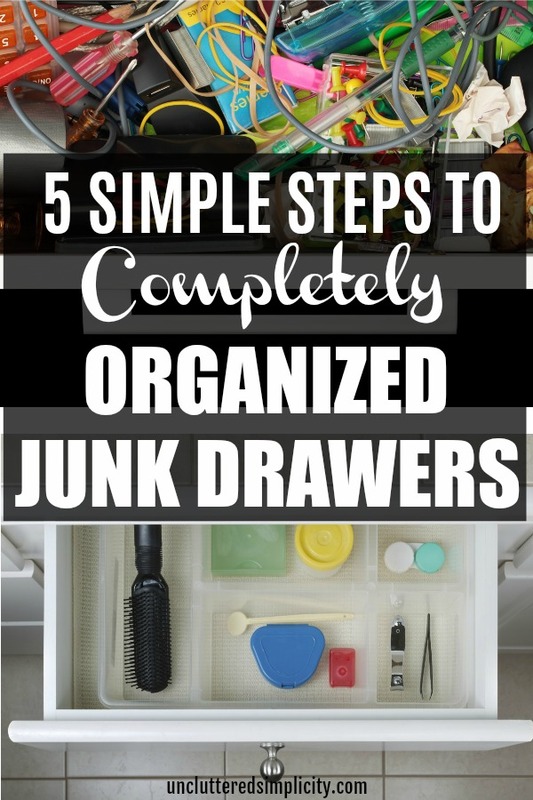 The first step to quick and easy junk drawer organization is to decide exactly what purpose you’d like your junk drawer to serve. Once you know this, you can then choose the perfect location for your junk drawer. For example, if you need a junk drawer for random office supplies which you use outside of the office area, first decide which items you’ll need to keep in the drawer. Next, pick a spot in your home where you find yourself using these items the most. This might be near the front door, or next to a kitchen counter. If you’re trying to organize an existing junk drawer, you’ll need to completely empty out the drawer first. Sorry, there’s no way around this step. Things always have to get worse before they can get better. *Tip: Once your drawer is empty, go ahead and give it a quick wipedown and install some contact paper in a fun/pretty print. Be ruthless in deciding which items need to be in your junk drawer and which items belong somewhere else in your home. Remember, you want to be able to open and close the junk drawer easily as well as know what’s inside. Once you’ve made your final decisions on which items to keep you’ll need to group like items together before moving on to the next step. Now, it’s time for my favorite part of junk drawer organization! I firmly believe that junk drawer storage solutions should be either (1) cheap or (2) free. There’s no need to raid the nearest container store when you can raid your own home for creative junk drawer storage solutions. Chances are, you already have many of these items lying around. egg cartons-to organize small screws, nails, etc. Tip: You can create your own custom junk drawer organizer with random scraps of wood (see how here). When it comes to junk drawer organization, the most important thing you’ll need to remember is to NEVER…EVER forget about your junk drawer. Trust me, this is easier said than done! If you periodically repeat these 5 simple steps (say, every few months or so), you’ll never have to sift through piles of randomness in your junk drawer again.